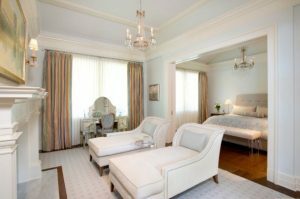 Just as Derek Lam’s eloquent, fresh-as-cream sheath marries soigné lines with a soft drape, so does Susan Shulman Interiors’ beautiful master bedroom and sitting area. Susan Shulman, who used to be in fashion, developed her command of fabrics and their properties at the retail level, buying at New York’s 7th Avenue. Here, her style of “timeless sophistication” and “restraint” is realized through a pairing of tailored fireside chaises, a soothing palette and shimmering draperies, which, like the pouf of Lam’s sleeve, bring softness and impact. 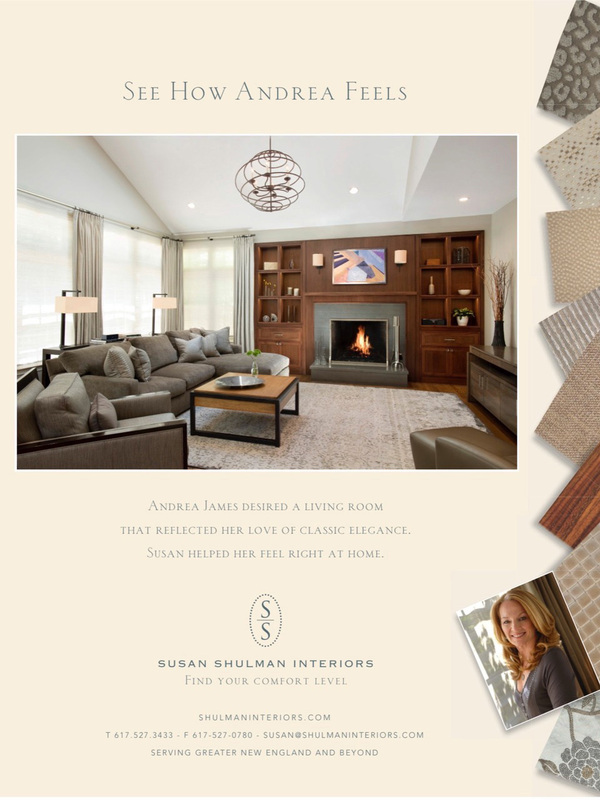 “I love a little bit of metalic,” says Susan Shulman, particularly in the dining room, master bath or bedroom. While Ralph Lauren incorporates a golden cascade in his eveningwear, Shulman opts instead for shimmering deep gray draperies. The resplendent patterned textile unites the room, drawing out hte tones of hushed silver and dove gray of the rug as well as the light-catching crystal candle chandelier and sconces. While metallic fabrics often aren’t durable enough for upholstery, she explains, they’re great for window treatments and accents. Watch these video excerpts from New England Dream House including the IFDA’s Designer’s choice award winning Best Kitchen. Susan Shulman Interior's expertise is often sought after to include in articles appearing in the following well known publications.